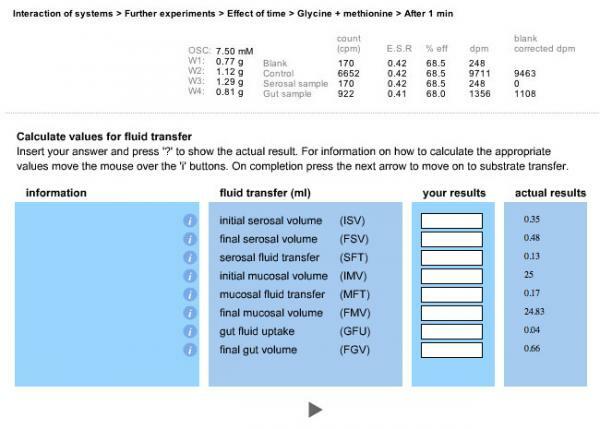 An interactive computer-simulation of experiments which may be performed on one of the classical in vitro techniques used to study intestinal absorption: the isolated, everted intestinal sac of the rat. The program simulates experiments designed to demonstrate the important characteristics of the transport of two important nutrients - hexoses and amino acids - in the small intestine. Introduction and Methods use a combination of text and high-resolution graphics to explain the everted sac preparation, the process of carrier-mediated transport of these nutrients and the methods used to measure it (using radiolabelled galactose, glycine and methionine and a scintillation counting technique). The Experiments section allows users to: 1. Measure the transport of these nutrients; 2. Demonstrate the Na+ dependence of the transport process; 3. Investigate the mutual interaction of the hexose and amino acid transport systems by performing a series of experiments (including a kinetic analysis and calculation of apparent Km and Vmax for the transport process) to assess whether the interaction is due to competition for energy or competition at the carrier level. The data is based on predictive models of carrier-mediated transport which have been verified by experiment. Target Audience: It is aimed at undergraduate students studying physiology on a range of biomedical courses.